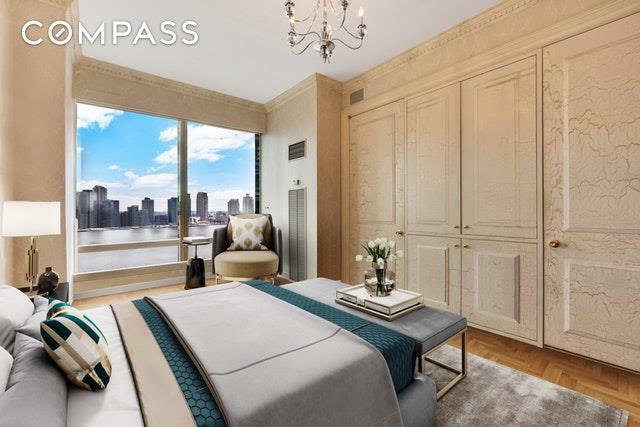 River and Park Views 10 ceilings 2br+/2.5ba Currently configured as a two bedroom suite with private baths plus a powder room and home office or nursery. 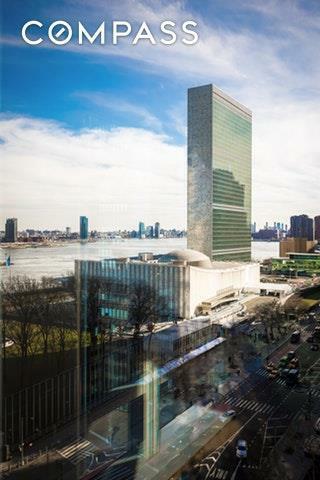 This 1,612-square-foot residence features 10 ceilings, wall-to-wall windows that frame unimpeded views of the U.N. Gardens and Secretariat Building, East River, Dag Hammarskjold Plaza, Roosevelt Island, Bridge and the Chrysler Building.The home offers a chic French Chateau vibe with stunning wallcoverings, fine millwork, herringbone floors and ornate chandeliers and sconces throughout. The corner great room features a handsome decorative fireplace, built-ins and jaw-dropping views to the south and east. The extra-large kitchen is well-equipped, washer/dryer and the split layout positions bedrooms on opposite sides of the home for optimal privacy. Multi zone air conditioning interior units. 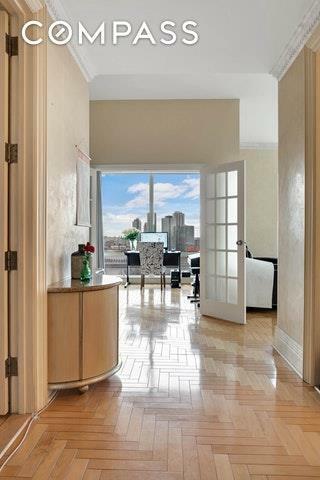 Custom closets and integrated electronics with surround sound add to this luxe high-floor home's abundant appeal.845 United Nations Plaza is a five-star condominium tower surrounded by lush gardens and a park. This investor-friendly building offers the lowest maintenance and property taxes in the area (less than $2 per square foot per month) plus responsive engineering staff and handymen for minor maintenance. Residents enjoy a long-list of premier amenities, including valet parking from the building's private drive; 24-hour concierge and doorman service; a landscaped garden and courtyard; private spa and 5,000-square-foot fitness center with 60-foot swimming pool; and private wine cellars.Located in prime Turtle Bay/ Midtown East directly across from the U.N. and within easy reach of Grand Central Terminal, MacArthur Playground, Urbanspace Food Hall, Dag Hammarskjold Plaza and the rest of Midtown. Easy access to E, M, 4/5/6, S and 7 trains and the East 34th Street ferry landing. 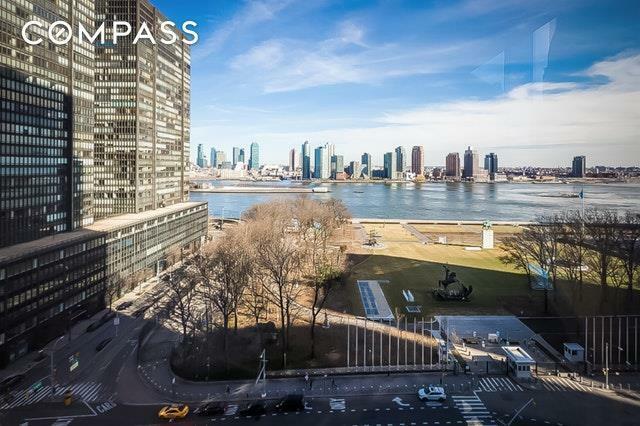 Easy entry onto northbound or southbound FDR to Midtown tunnel, Queensboro Bridge or Triboro Bridge for easy access to JFK and LaGuardia.Any interested 1031 exchange buyers should contact broker immediately, as can buy with tenant in place thru April.